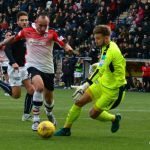 After last week’s struggles against a short-handed Hibs side the four hundred Raith fans who travelled to Falkirk may not have been optimistic facing the Leagues form side. 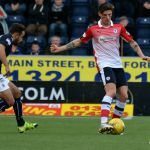 The hosts were on a six game unbeaten league run that had seen them climb to third. The plastic pitch was watered before kickoff and though autumnal the weather was pleasant with no wind to blame for errors. 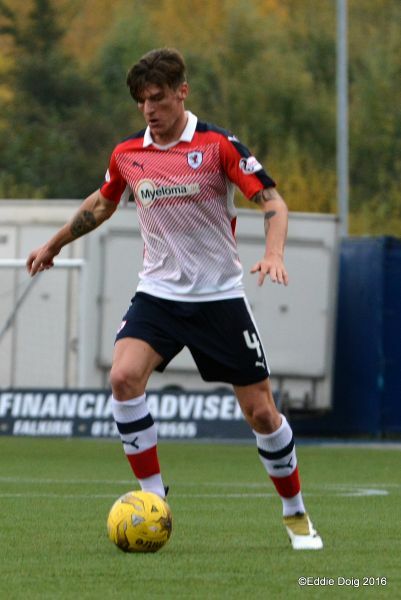 Rudi Skacel dropped to the bench with Mark Stewart taking his place up front. 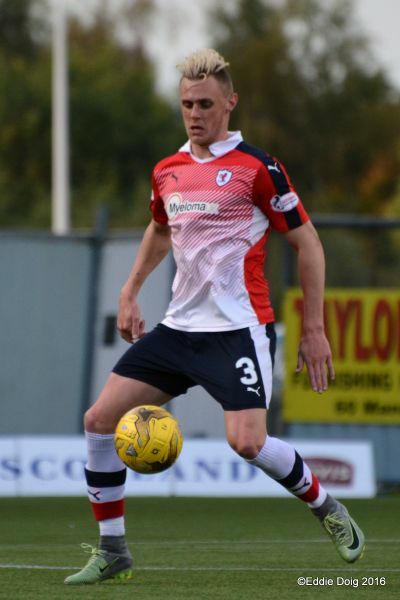 Iain Davidson again was filling in at right back with ex-Rover Paul Watson doing the same job for the hosts. 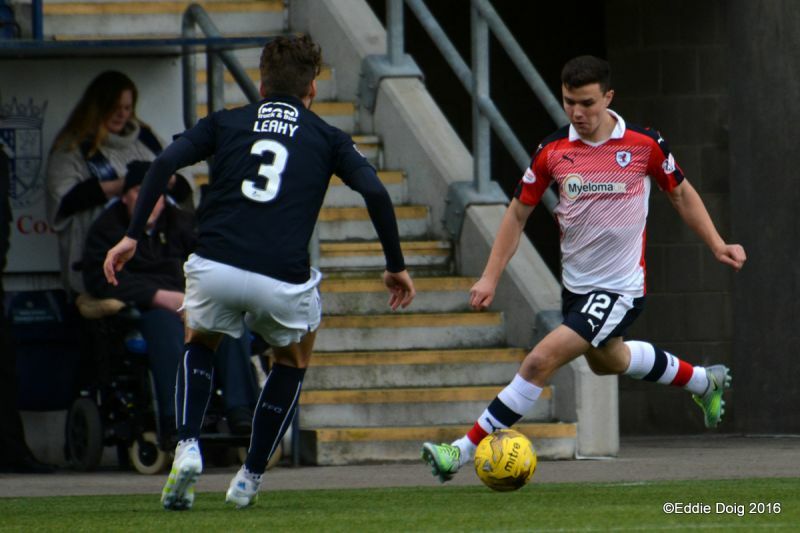 John Baird started for the Bairns watched by James Craigen, another other ex-Raith man, from the bench. 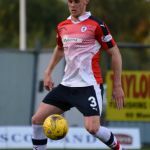 The Rovers were keen to get the ball forward quickly and in the sixteenth minute Barr and McHattie combined on the left playing in Stewart and the ball fell too Matthew’s whose effort was blocked up and away. 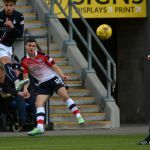 The corner was knocked down in the box and Iain Davidson leathered it low and hard giving Rogers no chance to put the Rovers one up. 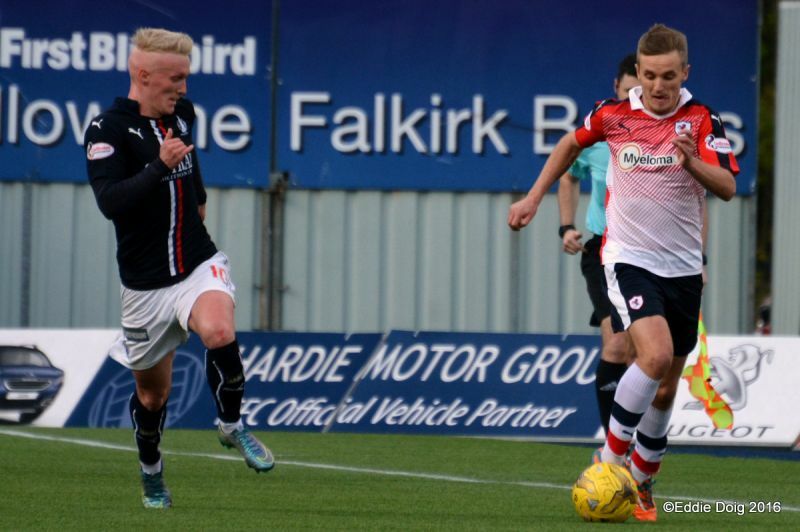 It’s important to hold a lead and set the agenda, Falkirk however had other ideas. 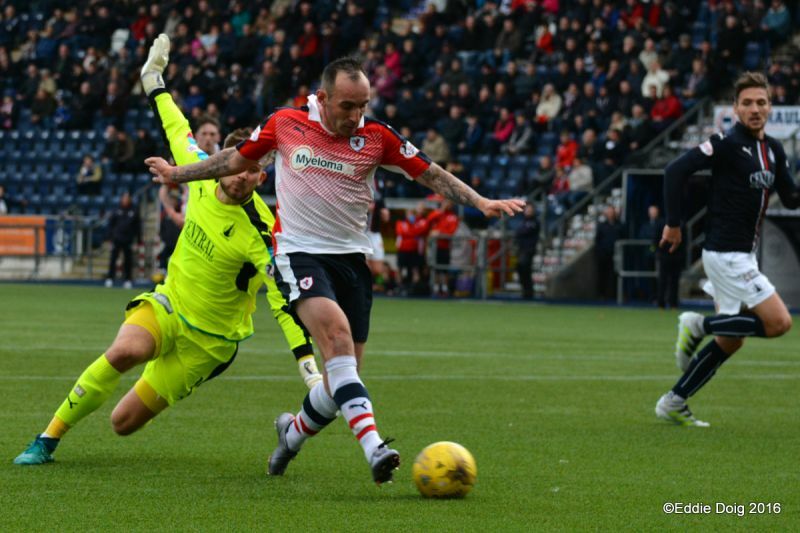 Hesitancy in the central defence saw M’Voto easily robbed by John Baird who slid the ball past an exposed Cuthbert. It was a gift that Baird was all too keen to take advantage of. 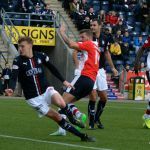 Soon after Paul Watson headed the ball in at the back post but the referee rightly ruled it out as he had been all over Davidson. 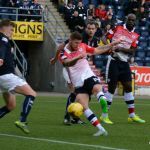 The home side continued to push on and Baird dummied a through ball wrong footing the Rovers defence, McHugh was closed down by Cuthbert. 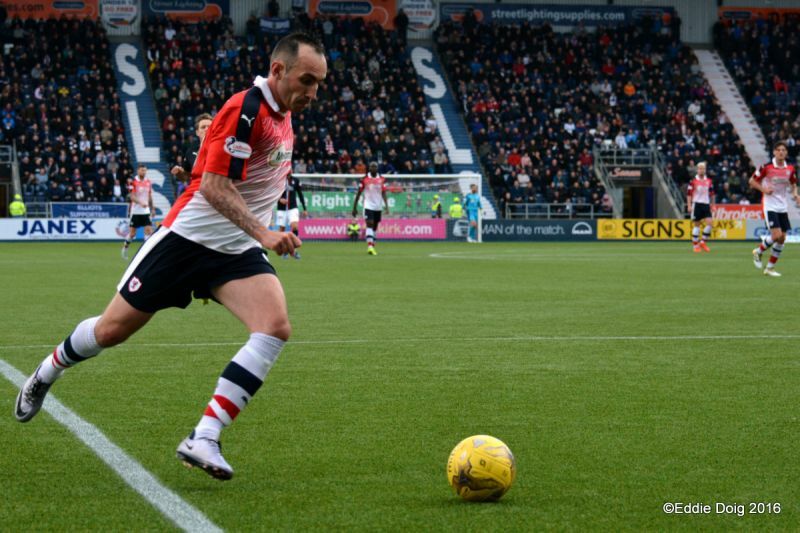 Squaring the ball he found Mark Kerr unmarked six yards out with only Davidson on the line to beat. 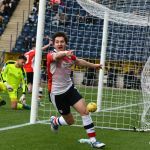 As everyone waited to see the net bulge he hit the ball a yard wide to the amazement of all present and the amusement of the Rovers fans. 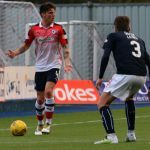 Moments later the experienced midfield man did better at the other end tracking back and sliding in well on Stewart who had been played in by McManus. 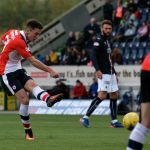 Kerr had a go from further out and got closer hitting a clearance from a corner just over from twenty two yards. 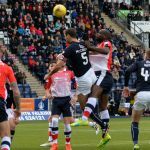 Good play from the home side saw Sibbald and Hippolyte combine to play in McHugh who shot tamely at Cuthbert when he could have done better. 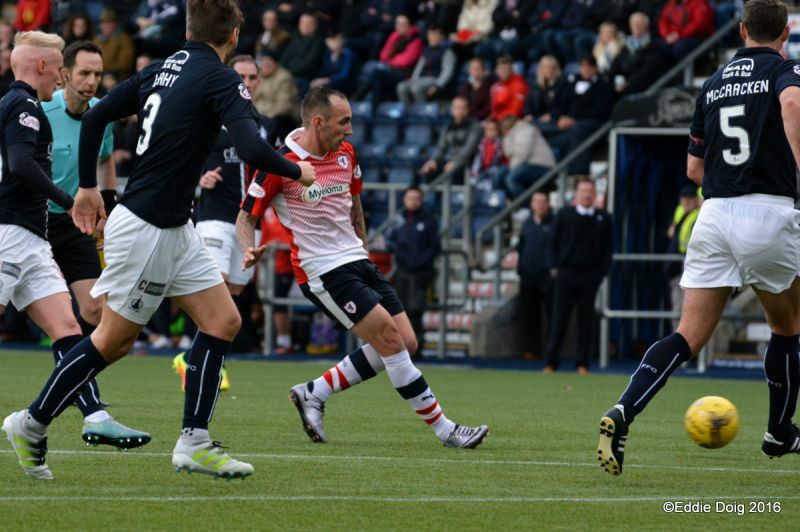 Three minutes later in the thirty sixth Bobby Barr did well wide left – much of the play had been on the other side of the park – taking advantage he cut inside and passed to McManus who’s effort was blocked having another Declan’s second attempt ended up squirming across the goal where his inrushing strike partner Mark Stewart headed the ball home from about a yard. Again the ball made a rare visit to the left of the pitch where Tom Taiwo got away with a hand ball before shooting well wide. 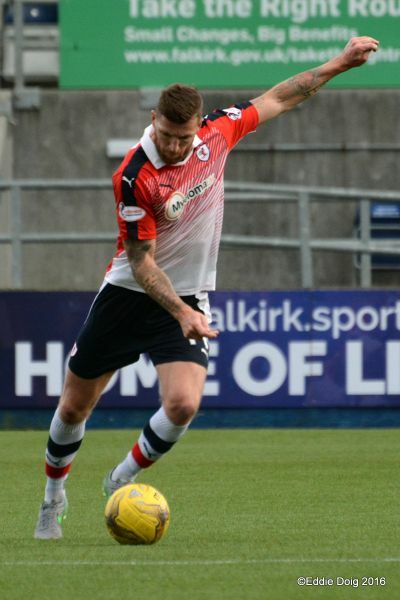 Then John Baird showed great control knocking the ball up twice then firing a volley just over the top corner of the Rovers goal with Cuthbert helpless. It was a moment of real quality. 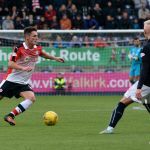 Just before the half Luke Leahy was rightly booked for a rash challenge. 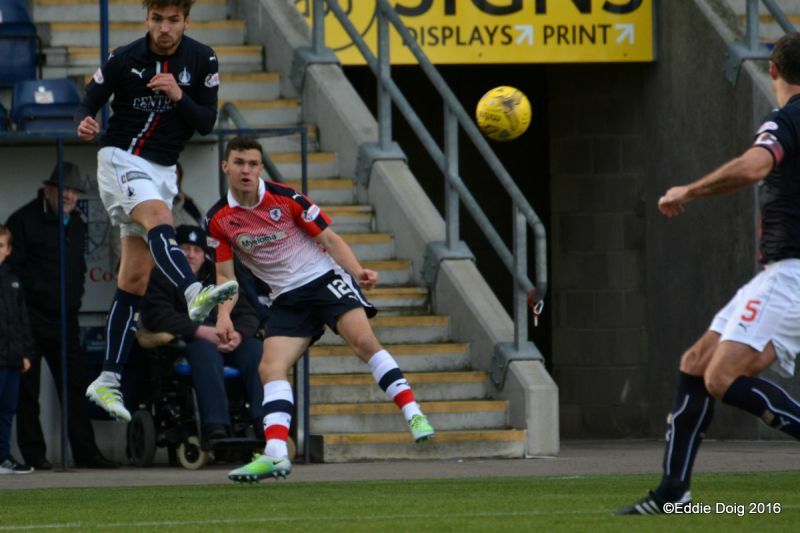 The Raith support were pleased to be in the lead at the half and many tried to think of a worse miss than Kerr’s. 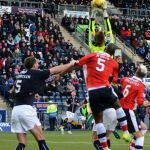 Hibs man Cummings last year no doubt getting a mention and older fans remembering Hampshire missing for Brechin as Ramiro Gonzales the Rovers keeper stood laughing at him. Attacking towards the Rovers support Stewart robbed Gasparatto and ran on leaving McCracken in his wake. 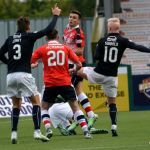 Getting into the box he took a touch too many and the ball was scrambled wide from where it was crossed back in but McCraken shoved McManus over as he tried to get his head on the ball. Maintaining their early pressure Benedictus headed a free kick wide but his blushes where spared by an offside flag. 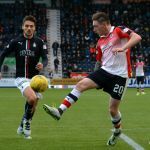 Davidson showed coolness and class to out play Hippolyte. 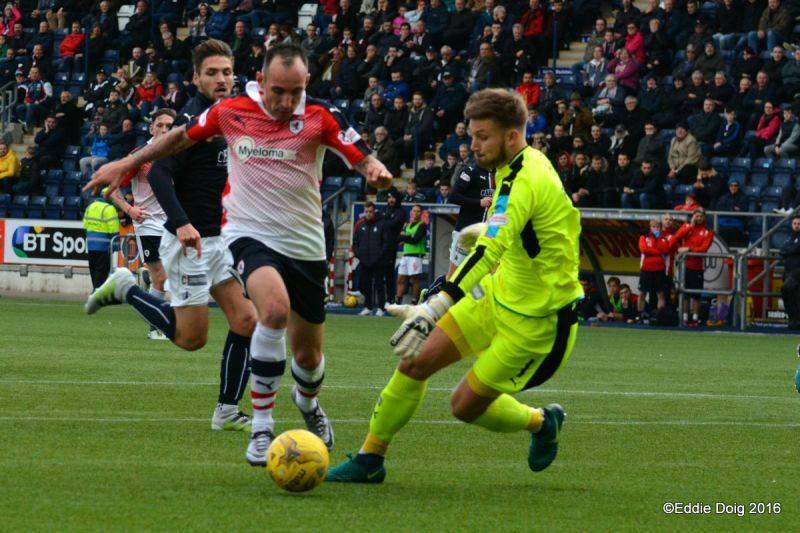 Davo, despite the early booking, was putting in another good performance. 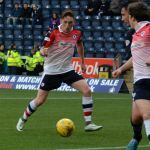 In only the fifty second minute Peter Houston made a double change taking off Taiwo and McHugh bringing on Lee Miller and James Craigen. 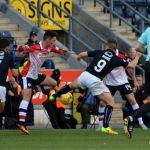 In the fifty third minute Benedictus and Sibbald tangled on the by-line at the other end, after indicating a bye kick the referee booked Benny. 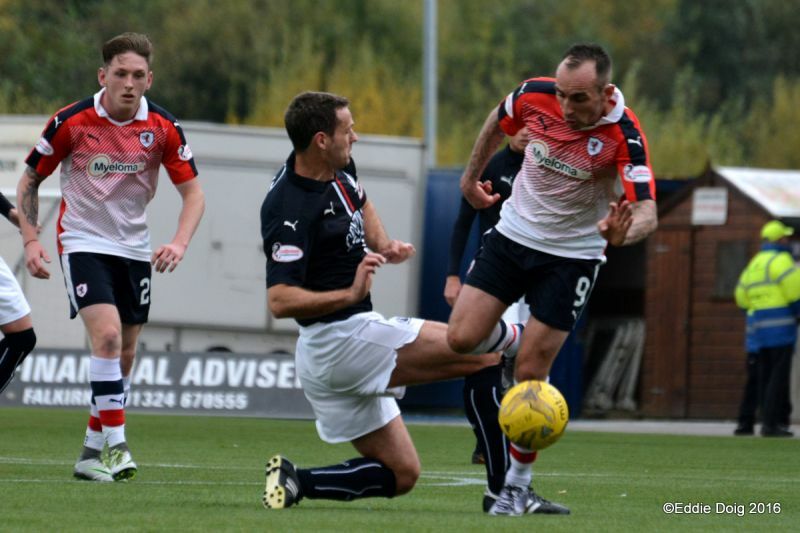 From our end we couldn’t see why and Gary Locke and Peter Houston were spoken to in turn following the incident. 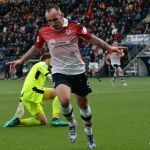 The Rovers gaffer was calm perhaps seeking clarification of the decision, while the home manager was very, very animated and continued to make his upset clear. 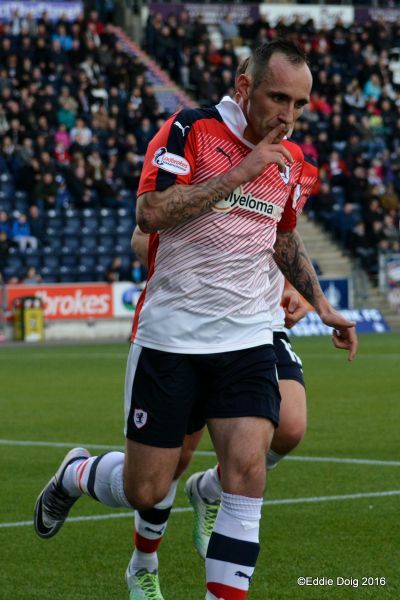 The whistler seemed to give him a chance to calm down but when he didn’t sent the Bairns manager to the stand. 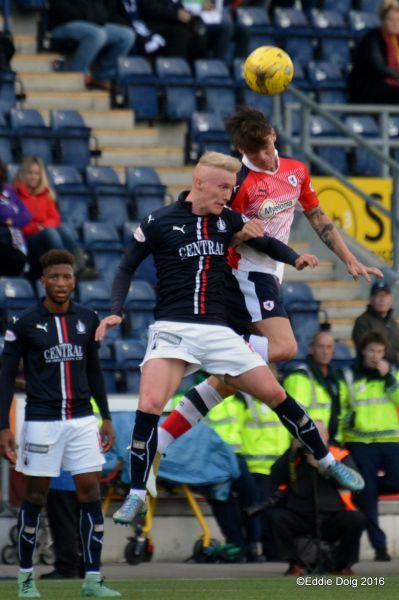 Craig Sibbald went down again moments later despite not having been touched. 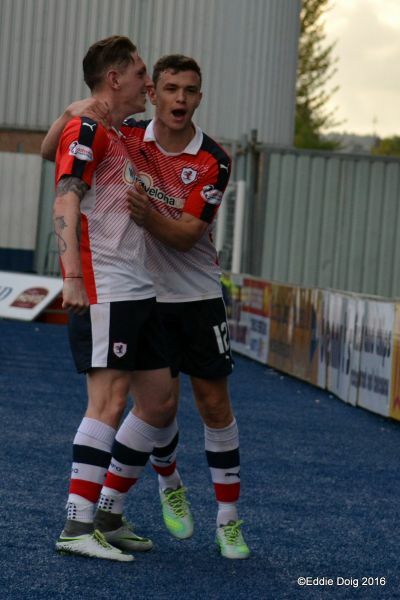 Matthews and McManus then combined drawing a free kick which Benny headed over. By now the pace of the game was high and the play harem scarem making your match reporter’s job more difficult. 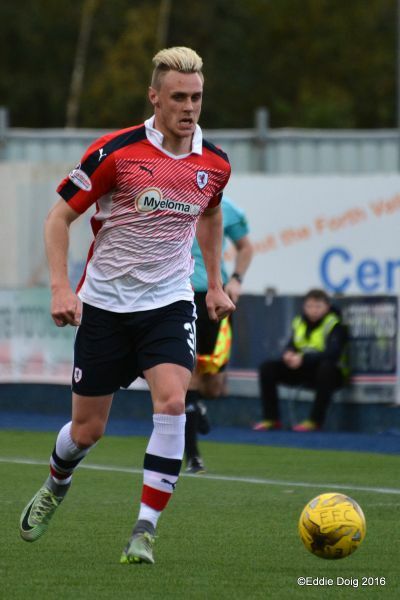 On the hour another break saw Barr then McManus wide play in a great cross but Stewart skied his first time effort. 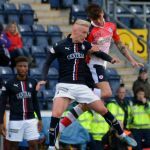 Benedictus made a key sliding challenge at the other end before Craigen saw a shot blocked then Miller’s follow up effort was also knocked away before the ball was cleared. 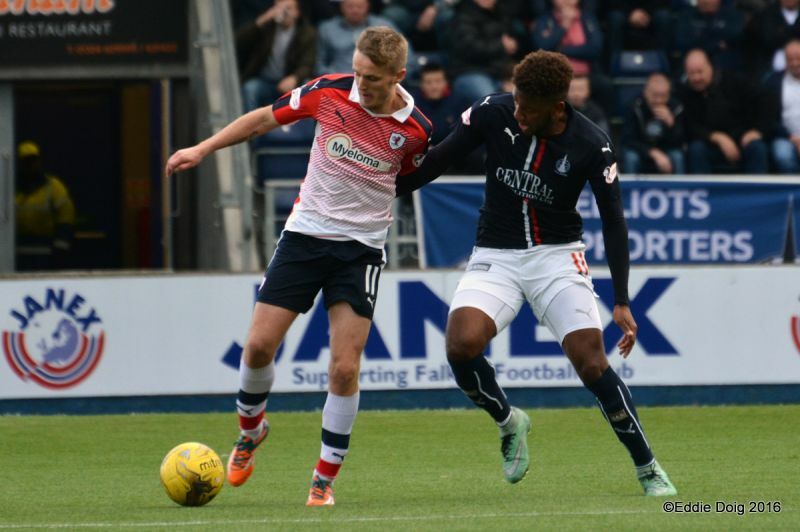 McHattie was booked then Hippolyte was replaced by Shepherd as the home side tried to maintain the frenetic pace. 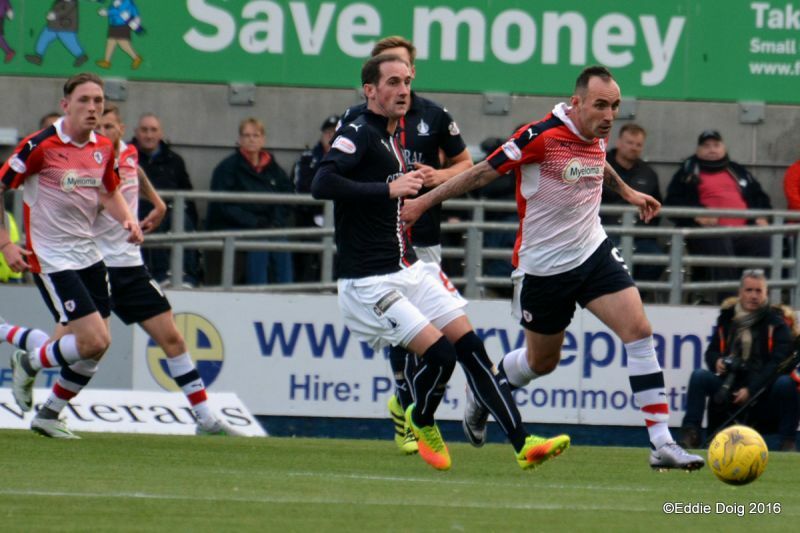 Next however the Rovers threatened, Stewart teeing up McManus in the box but he fell at the vital moment. 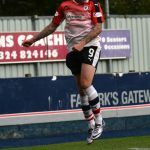 In the seventieth minute Bobby Barr stretched fouling Shepherd and remained on the ground indicating he was injured. He was helped off the field and replaced by Johnston. 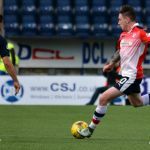 Moving forward again quickly Mark Stewart got wide and played a perfect ball across for Declan McManus to put the ball in from five yards out. The Fleetwood man showing Kerr how it should be done. 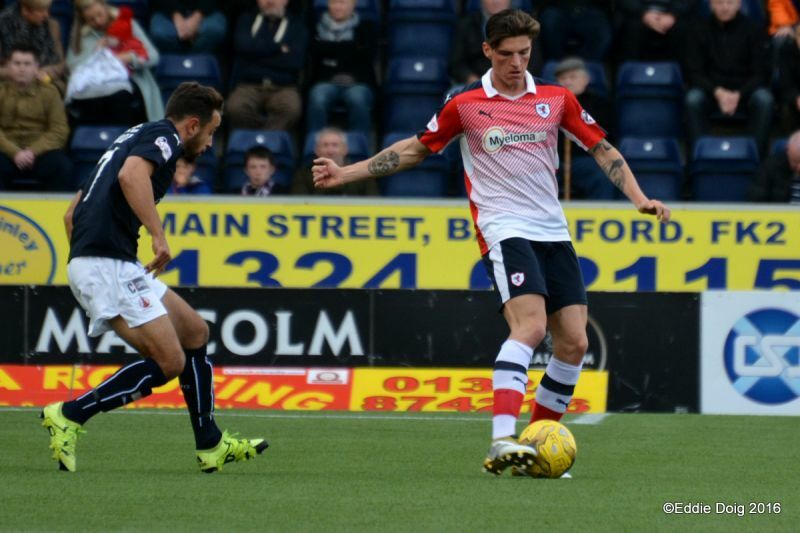 This time the Rovers needed to keep things tight and see out the game leading as they now were 1:3. 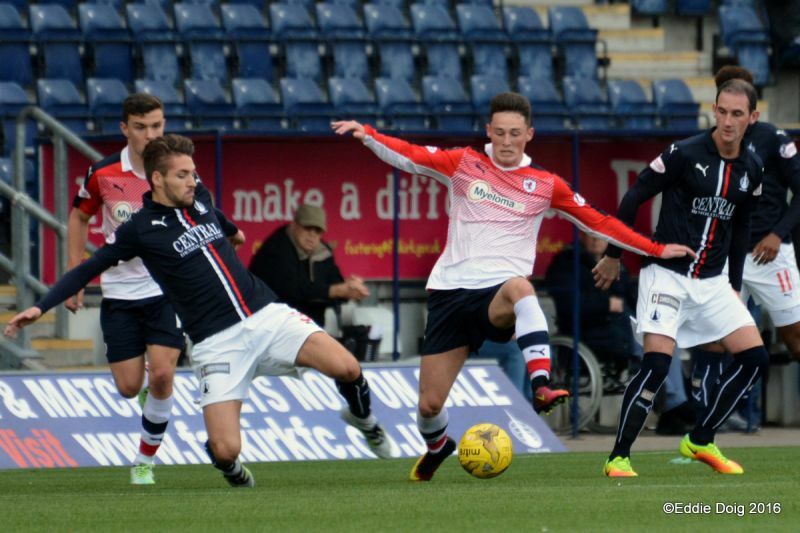 Falkirk again had other ideas and only four minutes later they halved the lead. 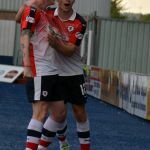 Craigen crossed deep and Shepherd put the ball back into the middle where Lee Miller had an easy header to make it 2:3. Pushing on with fresher legs the home side continued to look dangerous as the Rovers tired. 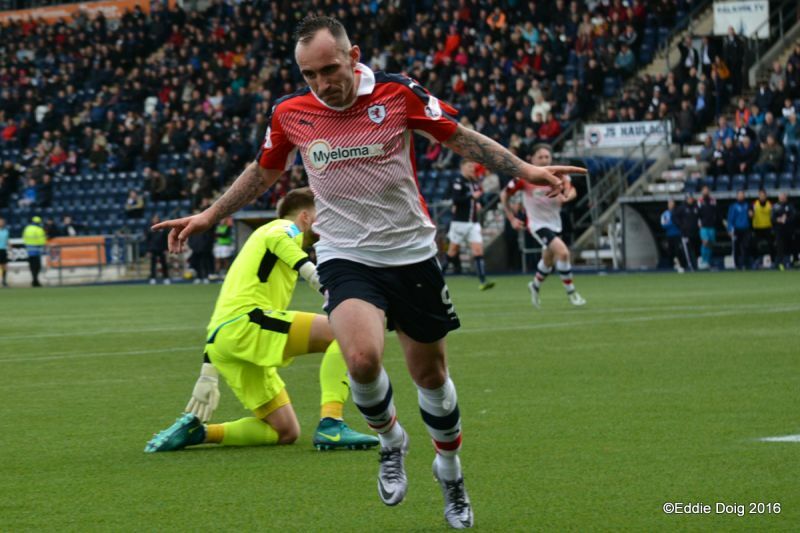 One man in red and white however still had plenty gas in the tank and ran goal ward drawing the keeper before sliding the ball into the back of the net in front of the jubilant travelling support. 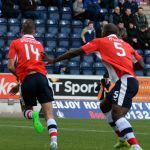 Mark Stewart scoring his second of the day with aplomb before wheeling away to celebrate with his perusing team mates. Four two up with more than ten minutes to go there were still a couple of twists and turns to come. 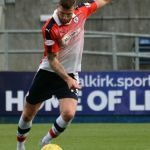 Iain Davidson cooly headed a dangerous ball to where he thought Cuthbert would be but the keeper had come to take the ball and it bounced just wide. 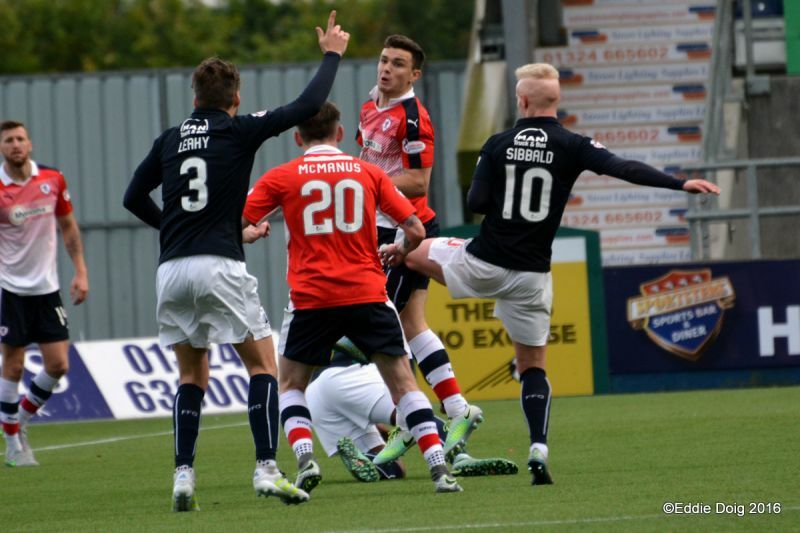 The home side did not capitalise from the resulting corner. 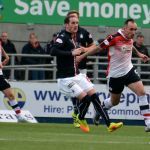 Scott Roberts replaced Mark Stewart who was applauded by the Rovers support to a man (and woman). 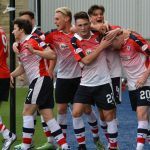 As time wound down Sibbald smashed a free kick against the Rovers defensive wall then put the rebound wide before McManus was booked then replaced by Lewis Vaughan. 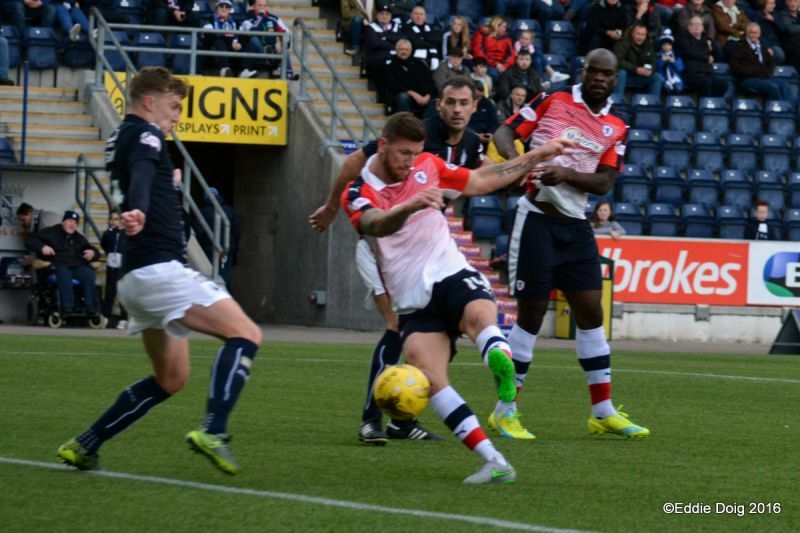 The last action saw a heavy Leahy challenge on Benedictus who had already headed the ball to safety. 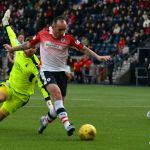 After the dip in form the Rovers had had of late this was a very welcome result against one of the league’s best sides. 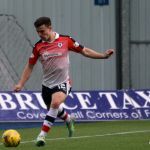 Benedictus, Davidson and Stewart did particularly well and hopefully the injury to Bobby Barr will not be significant as otherwise it was good performance and a cracking three points. Welcome to the Falkirk Stadium, it's 11 degrees and slightly cloudy. 25 years ago this week Peter Houston left Falkirk to sign for East Stirlingshire. Goal scorers from midweek, Lewis Vaughan and Joel Coustrain are on the bench today. 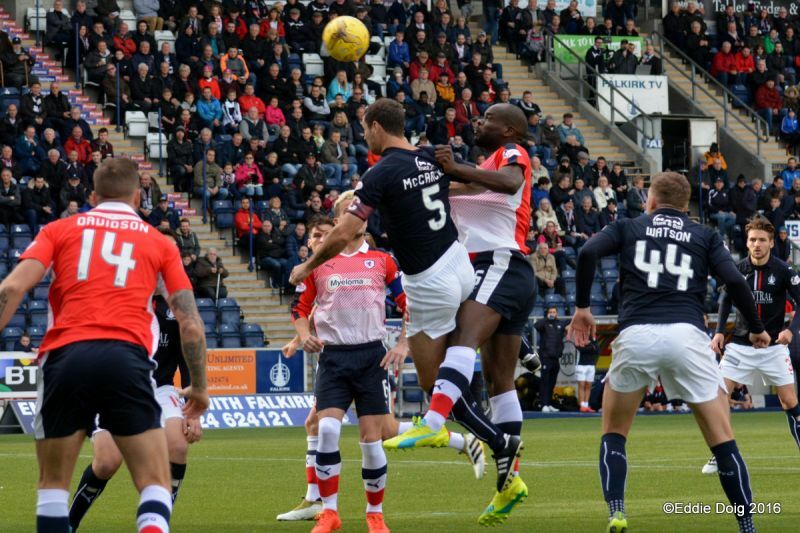 Falkirk kick off towards the North Stand the ball is won and Stewart forces an early save from Rogers. 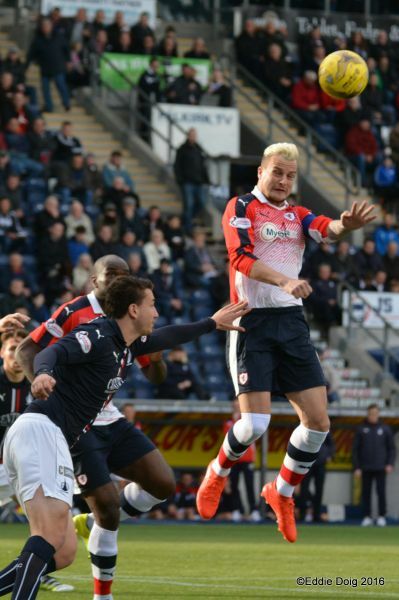 From the corner Benedictus with a header that brought the best out of Rogers once more. 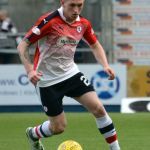 Davidson at right back for a second week. 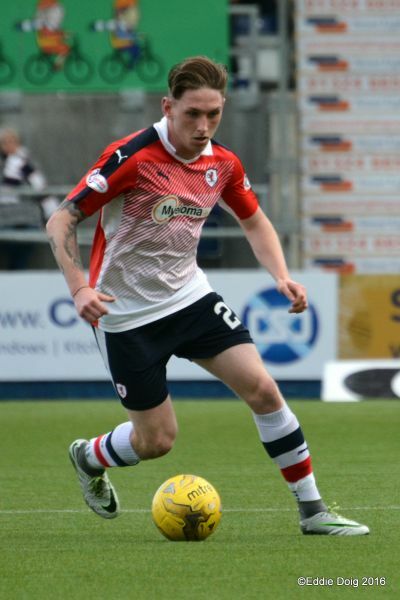 Falkirk also with an impromptu right back, Paul Watson. 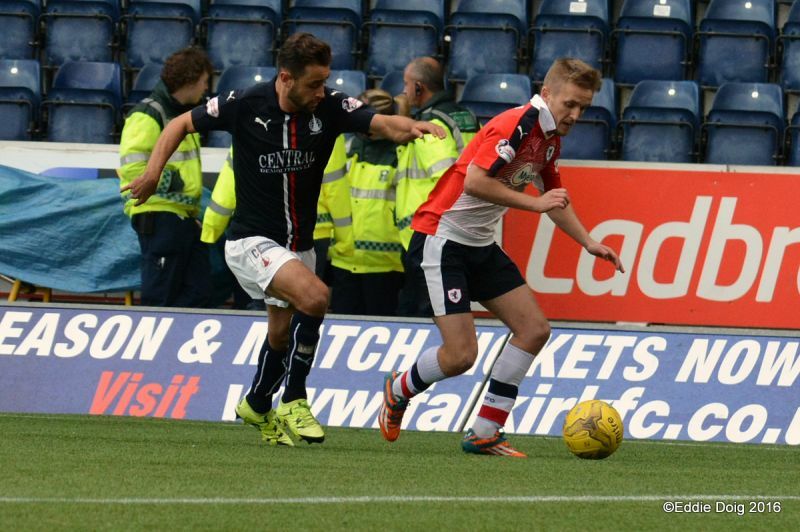 Falkirk and Rovers having problems finding their forwards with the long ball. Kerr the recipient of his own rebounded free kick shoots ridiculously wide from 30 yards. 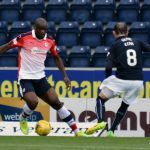 Jean-Yves showing marvellous ball skills, dribbling the ball out of trouble. 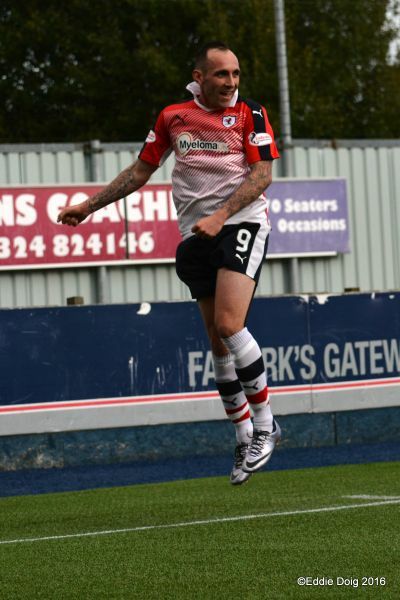 GOAL ROVERS Ian Davidson with a tap in from a corner. 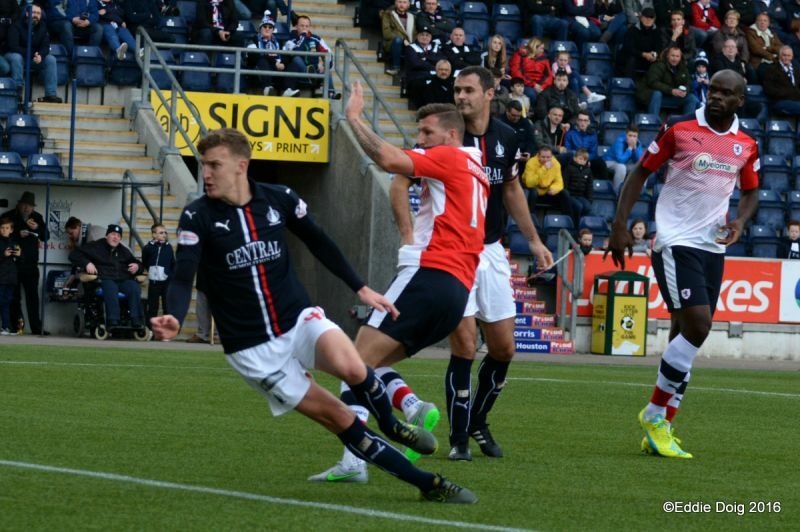 Goal Falkirk, Baird capitalises on a mix up in the box and taps in from 4 yards. 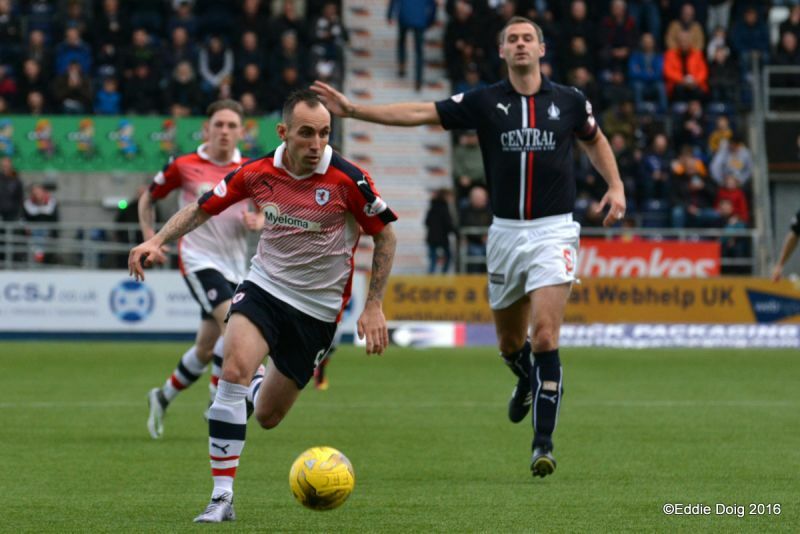 The ball is in the Raith net but is chalked off for a Watson foul on Davidson. Bob McHugh and Luca Gasparatto both receiving treatment. 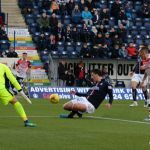 Comic failure by Falkirk, McHugh through has his shot parried by Cuthbert and Kerr with an open goal sclaffs the ball wide. 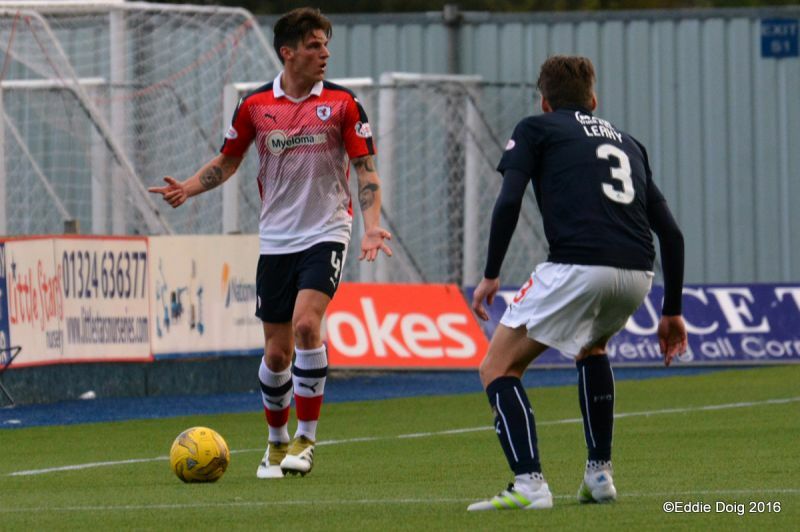 McManus and Stewart combined, the latter has his shot blocked in the box. GOAL ROVERS, Matthews with a shot on the left, Rogers parries into Stewart who nodded hom from 3 yards. 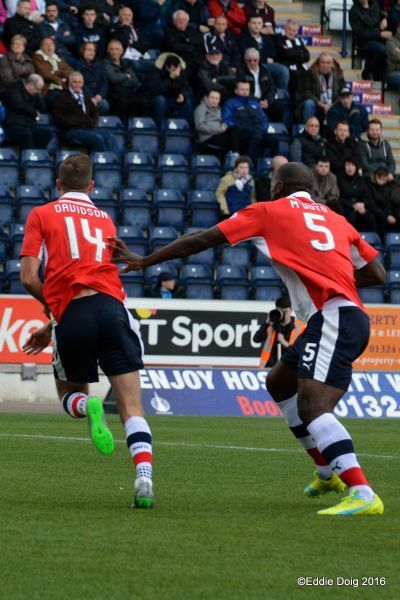 Hippolyte with a 20 yard cross finds Baird who shot high over the bar from 25 yards out. Leahy yellow for a foul on Matthews. Mr Cook gets the second half underway. Stewart on the breakaway fails to capitalise 1 on 1 with Rogers. 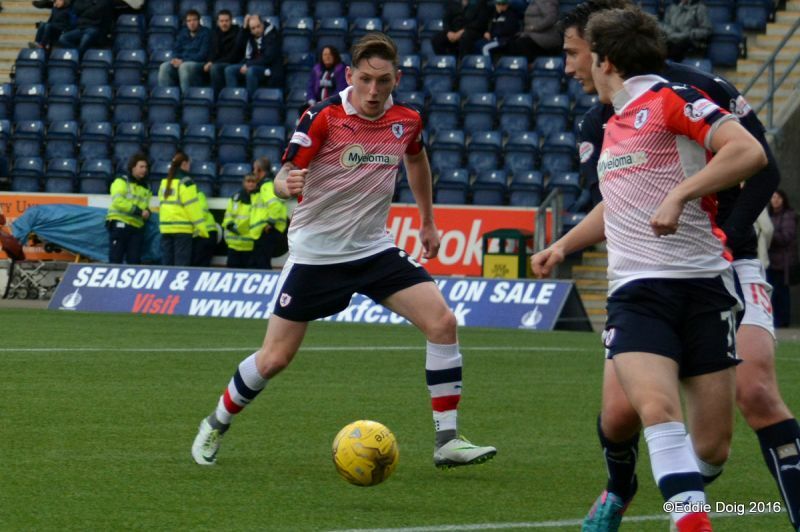 Stewart puts Callachan through, Rogers runs out of his area to clear. Barr with the cross from a free kick, Benedictus heads wide at the back post, but is offside. 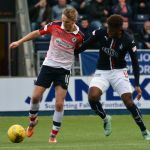 Taiwo and McHugh off, Miller and Craigen on. 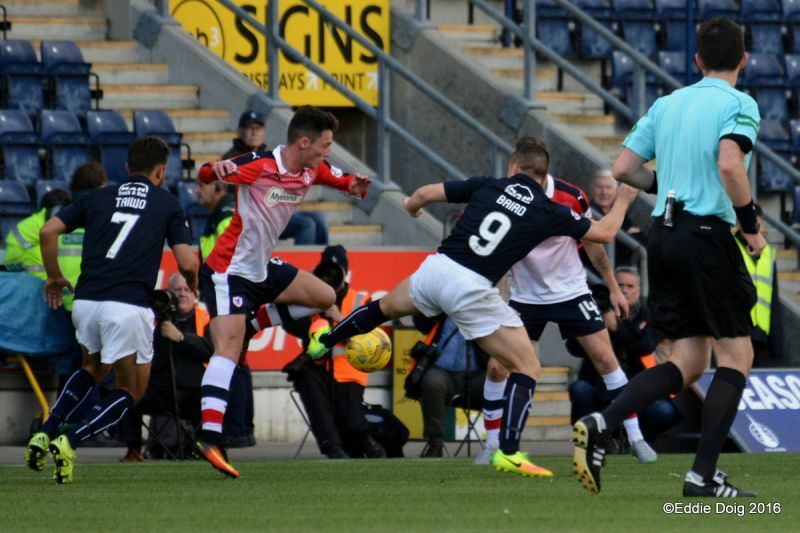 The referee is clarifing his decision to Locke when Houston intervenes then the Falkirk boss is sent to the stand. Barr and McManus combine, Stewart shoots over from 6 yards. 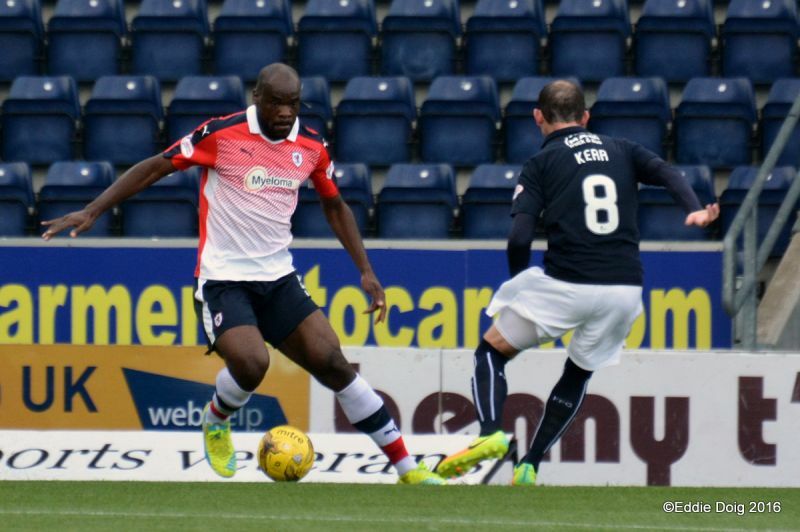 Falkirk pressing but sloppy passes are letting them down. 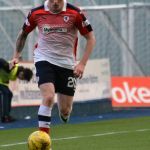 Craigen with a shot, shouts for a penalty as McHattie cleared. 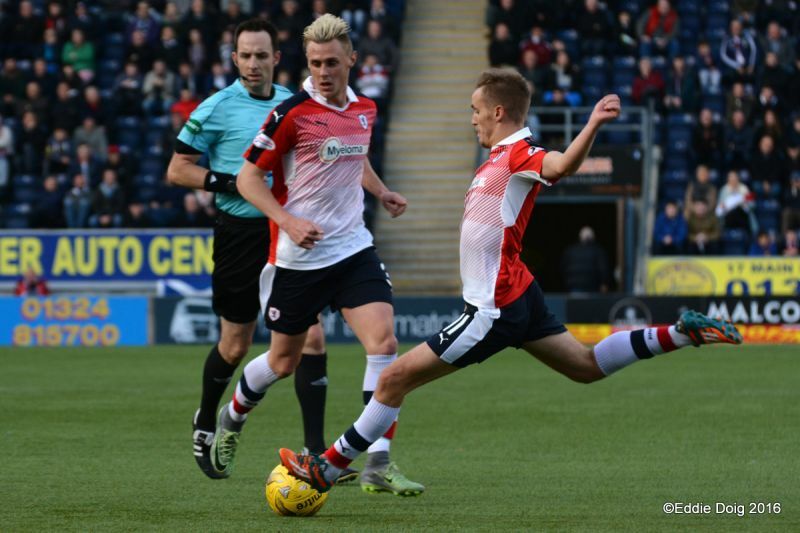 McHattie yellow for a heavy challenge on Sibbald. 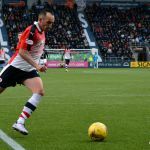 Stewart holds the ball up for McManus but he slips in the box and gives away the ball. Barr is helped off the pitch to be replaced by Johnston. 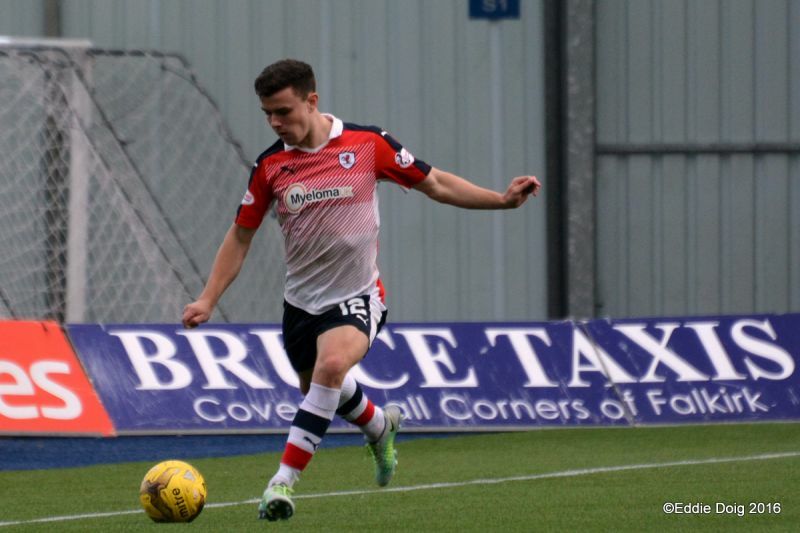 Stewart and McManus combine with a 1-2 the latter shoots into an open goal from 10 yards. 399 travelling supporters today, well done folks. 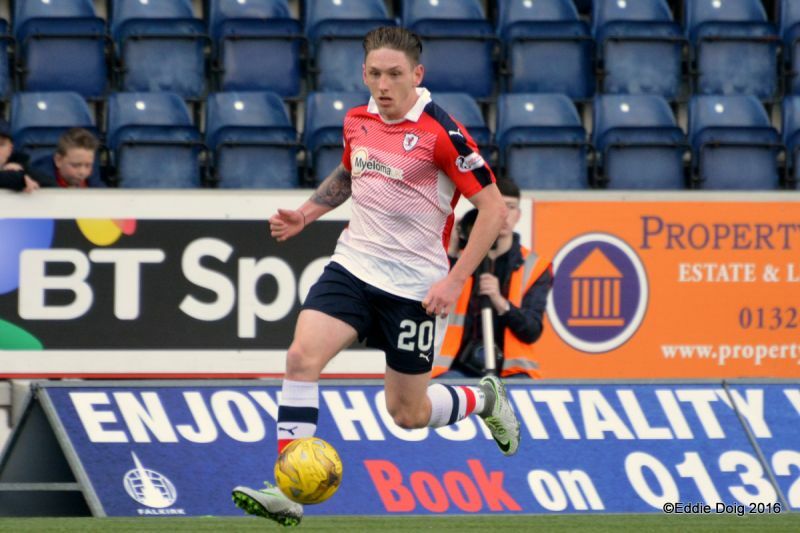 Goal Falkirk, Miller heads home from 6 yards. 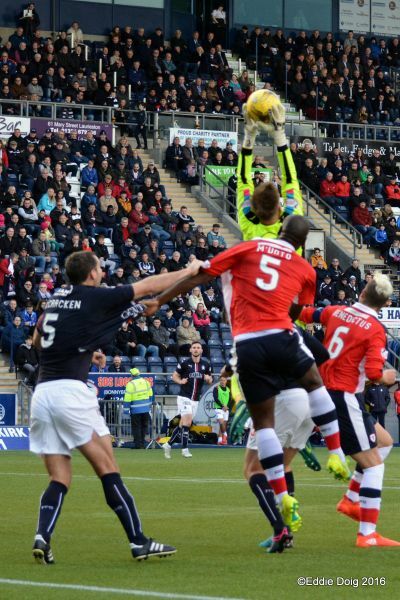 Stewart winning the ball from a poor attempt at a clearance rounded the keeper and slots home from 6 yards. 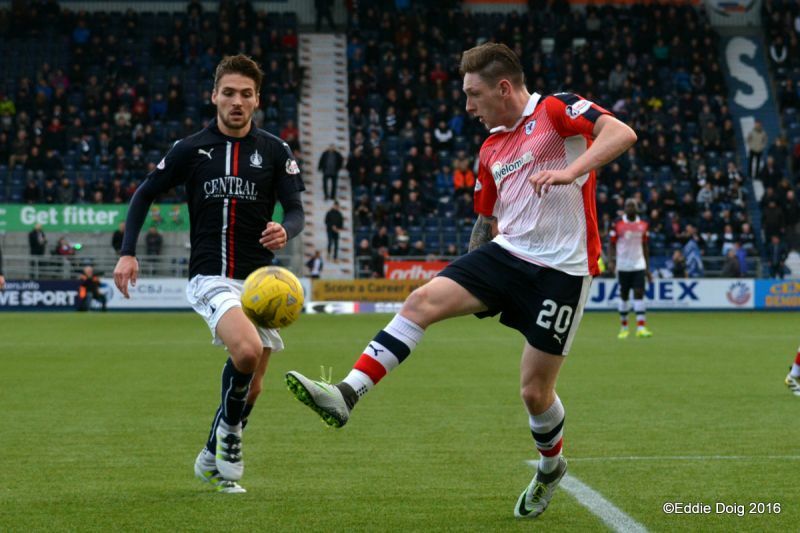 The travelling support singing the praises of Gary Locke. 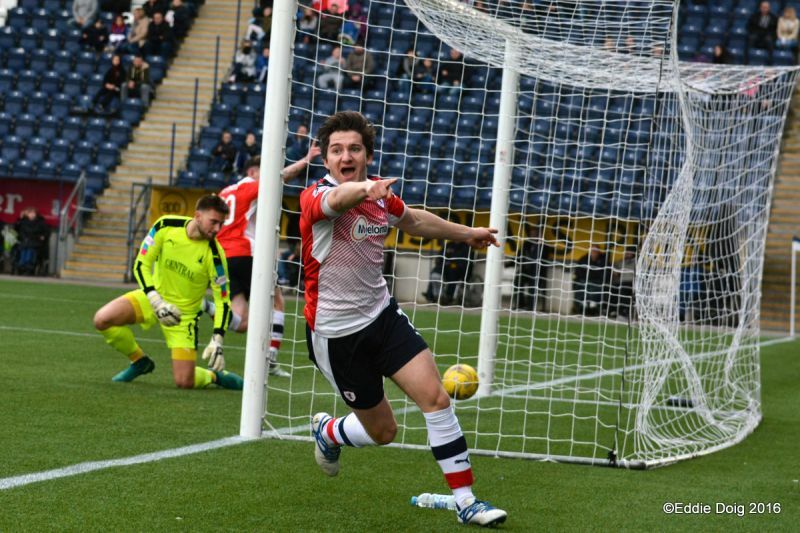 Davidson nearly with an own goal from a backward header to Cuthbert, the ball rolling into the side net. 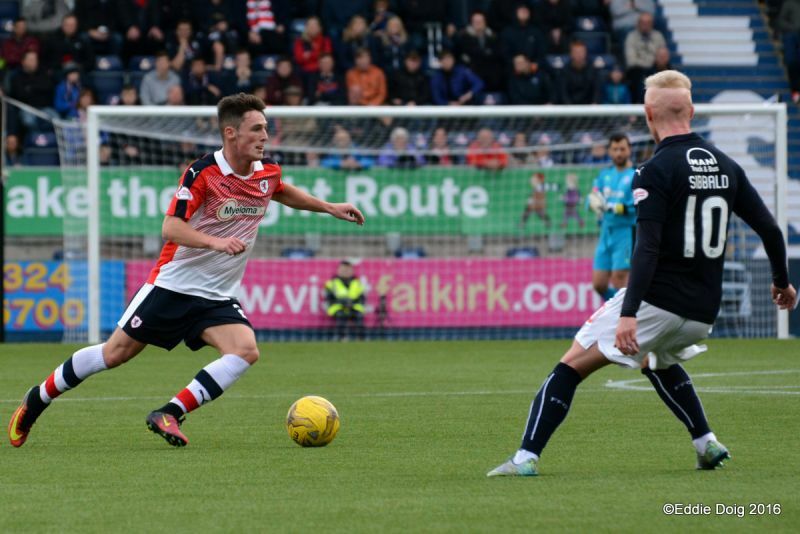 McHattie survived sanction for a foul on Shepherd. 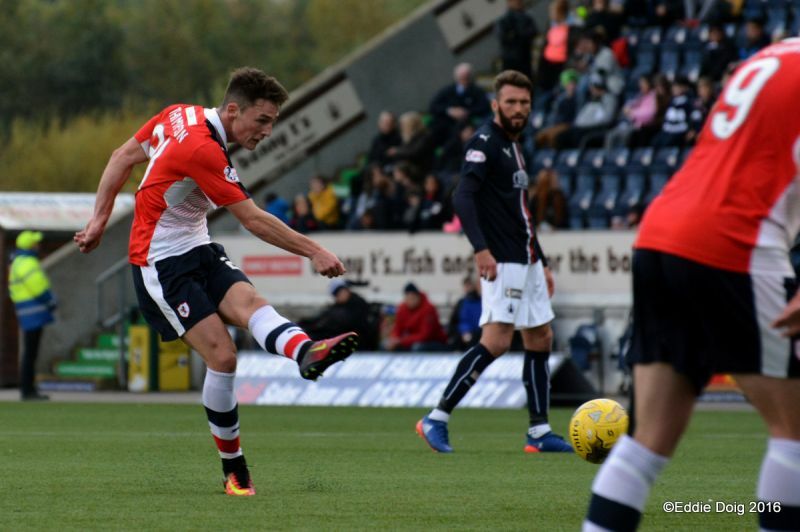 Sibbald shoots wide from the resultant free kick. 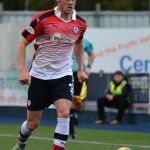 +1 Baird with a shot come cross watched as the ball drifts wide. 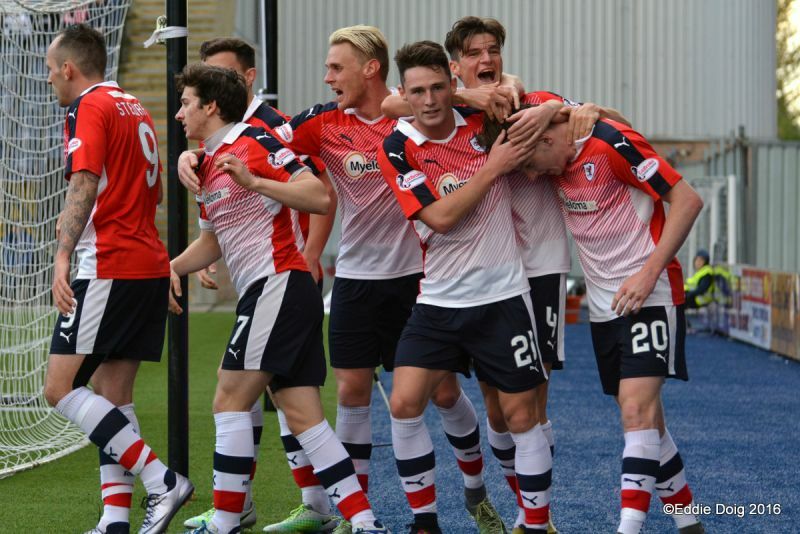 Well done lads, Raith Rovers leapfrog over our hosts into fourth place in the table. 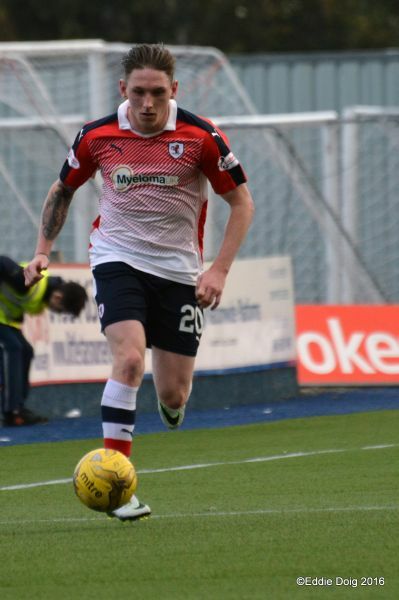 Rogers, Leahy, McCracken, Taiwo, Kerr, Baird, Sibbald, Hippolyte, Gasparatto, McHugh, Watson. Subs Mehmet, Rankin, Grant, Miller, Shepherd, Gallagher, Craigen. 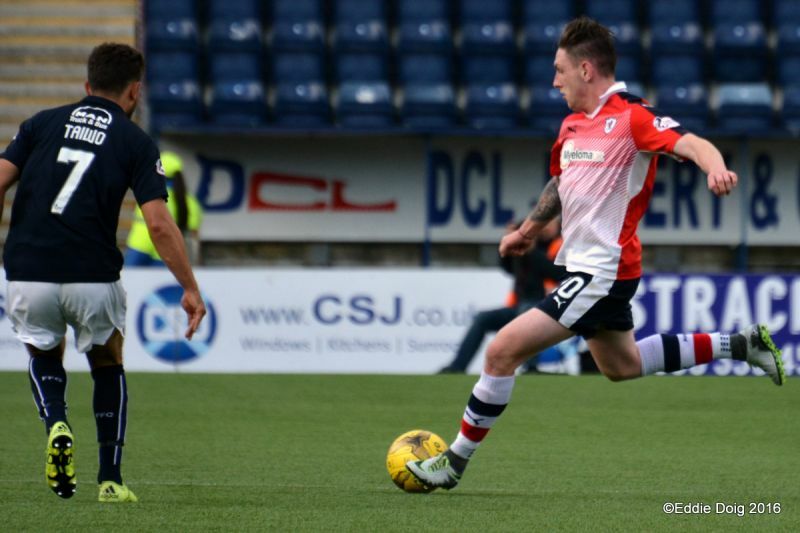 Cuthbert, McHattie, Callachan, M'Voto, Benedictus, Stewart, B Barr, Matthews, Davidson, McManus, Jordan Thomson. 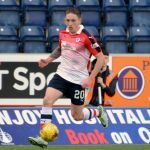 Subs Lennox, Johnston, Vaughan, Coustrain, Roberts, Skacel. 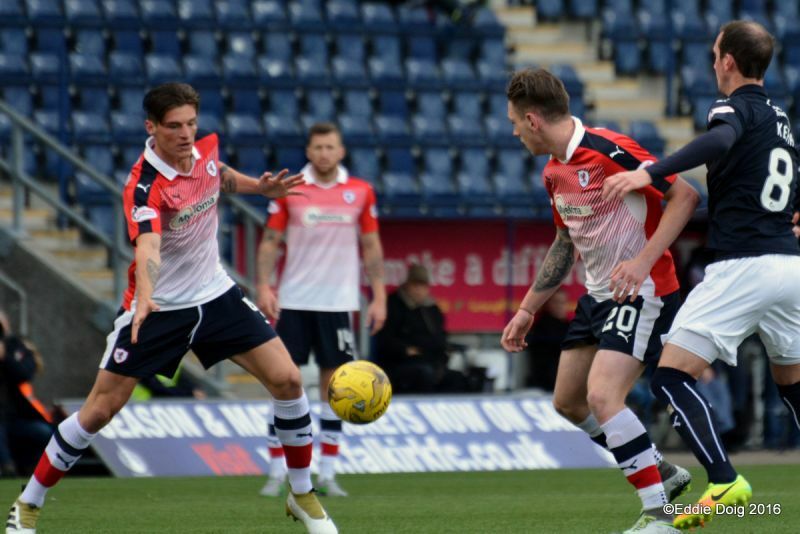 Raith Rovers head to Falkirk this Saturday, looking to pick up their first win over the Bairns since 2014, in what would be just their second league victory over Peter Houston’s side in 16 attempts. 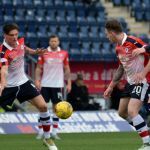 They’ll have their work cut out for them however, against a Falkirk team who as well as being the Championship’s form side, have the best home record in the division. 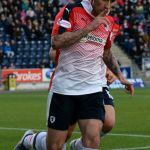 Although Falkirk started the season slowly, with just one point from their first three matches, a sequence of five wins and a draw now sees them in third place in the table, just a point behind first placed Hibernian and second placed Queen of the South. 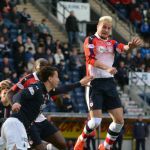 While that run has also lifted them above Raith in the table, a win from Gary Locke’s team at the weekend, would see Rovers move level again on points. 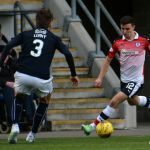 The last meeting at Stark’s Park in September saw Falkirk pick up their first away league win in this season, with the goals coming from John Baird and Tom Taiwo in a 2-0 win for the visitors. 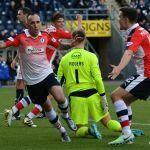 The result also inflicted Raith’s first defeat in the league since a 2-0 loss to Rangers at Ibrox on the opening day of March. 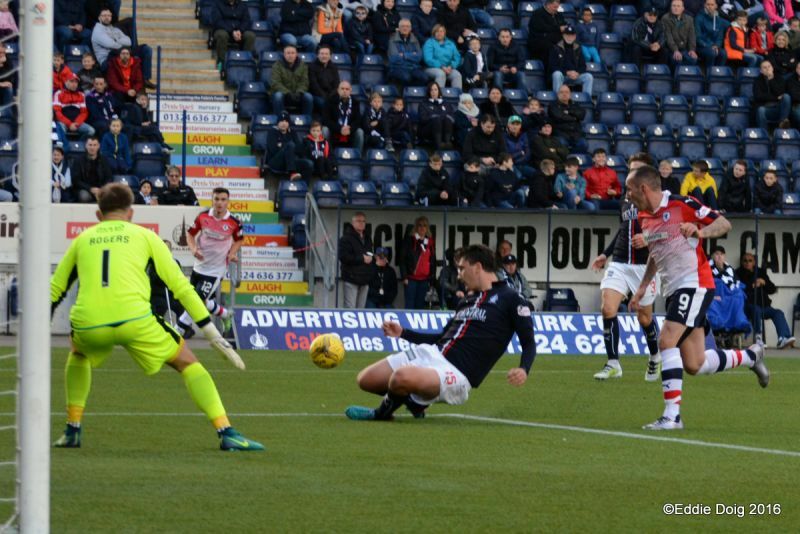 The two goal margin of victory was the first time either side had won this fixture by more than one goal since a 4-2 win for Falkirk at Stark’s Park in March 2014. 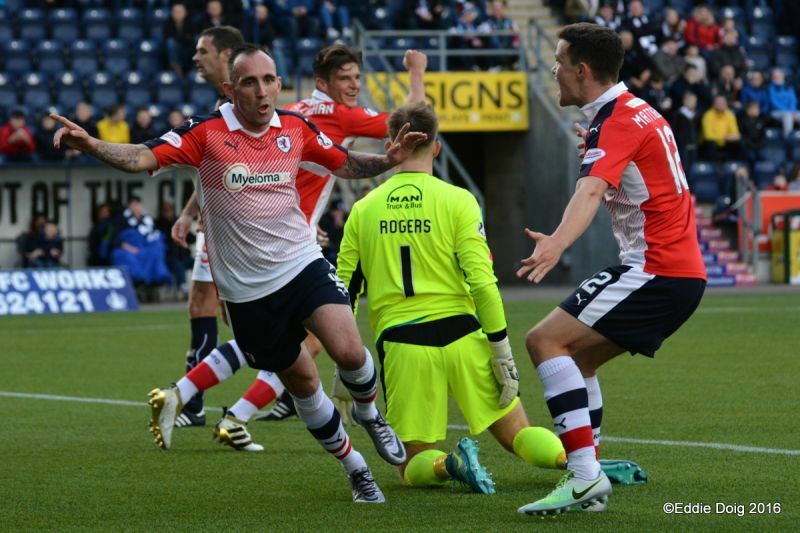 Raith’s last league win over Falkirk occurred in December 2014, when a late Ryan Conroy goal from close range was enough to seal a 1-0 victory.